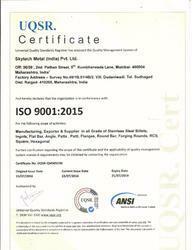 Established in the year 2005, we, “Skytech Rolling Mill Pvt. Ltd.”, are an enviable organization, which is engaged in manufacturing, supplying and exporting a comprehensive assortment of Stainless Steel & Metal Products. The range offered by us constitutes Stainless Steel Railing Flat Bar, Stainless Steel Bright Finish Flat Bar, and SS Round Bars. At our end, these stainless steel products are designed in accordance with the international quality standards with the help of ultra-modern machinery and technology, installed at our premises. These products are widely appreciated for their features like high tensile strength, corrosion resistance, dimensional accuracy, abrasion resistance and easy installation. Owing to these features, our offered products are demanded various industrial purposes. Depending on our spacious and vast infrastructure facility that is spread across an extensive area of premises, we have been able to cater to the organizational goals in a sophisticated manner. Spread across an extensive area of premises, our infrastructure is installed with advanced machinery and cutting-edge technology. In addition, for proper execution of business operations, we have segregated our infrastructure into different departments namely, manufacturing, quality controlling, warehousing and packaging units. Under the guidance of our mentor, 'Mr. Vinod Jain', we have successfully attained a formidable position. His vast experience and knowledge have helped us attain maximum client contentment. Supported by the dedicated and competent team of professionals, we have been able to manufacture, supply and export Stainless Steel & Metal Products. In order to offer best-in-class products to our customers, our team works in close coordination with our customers. Our team comprises administrative staff, engineers, manufacturing personnel and quality controllers. Apart from this, regular training sessions are conducted for our team in order to keep them updated. With dedication and commitment, we are serving a wide industry base. By offering high-quality products, we are able to carve a niche in the market and have been able to attain maximum trust and satisfaction of clients. To carve the unique niche for our organization, we are engaged in manufacturing, supplying and exporting Stainless Steel & Metal Products. Attaining maximum client satisfaction is our primary aim, keeping in mind the same, we ensure quality is never compromised. By following ethical business policies and transparent dealings, we have attained the respectable position. Owing to our state-of-the-art infrastructure facility, competent team of professionals and timely delivery of consignment, we have gained huge client-base.